Rosahl is the world’s smallest electric dehumidifier. This page provides an introduction to the products, their benefits, and how to use them. Where are Rosahl micro-dehumidifiers used? The Mitsubishi Electric Corporation in Japan developed Rosahl. It was in response to demand for compact and maintenance free air-drying solutions to protect sensitive equipment from moisture damage. It has since found its way into a wide range of other uses. These include for protecting museum display cabinets, telecoms. equipment, LED lighting, lasers, instrumentation and electrical cabinets and more. How to membrane dehumidifiers work? Rosahl dehumidifiers work by electrolysis when a suitable 3V D.C. power supply. They act like an ionic pump to remove water vapour at a molecular level, without involving liquid water. Importantly, no liquid water means no cleaning, no draining and no maintenance. With low running costs, they are suitable for use in remote locations, and where a conventional dehumidifier is difficult to maintain or to service. Designed for industrial and commercial applications, Rosahl membranes offer a long-term solution to humidity control for enclosures. Applications range from storage areas for sensitive equipment through to challenging or remote external environments, and many other uses. Rosahl is a low energy moisture extraction system and has a low capacity relative larger conventional (condensing) dehumidifiers. The process does not involve liquid water. So, unlike condensing humidifiers, they require no cleaning or draining: unlike silica gel, they do not require regular recharging or replacement. ROSAHL products consume very little energy compared to other types of humidification. This means they will run 24 hours a day, 365 days a year, continuously extracting moisture from an enclosed area without incurring major energy costs. Because they are maintenance free, they will continue working for years without concern. This means no servicing and lower cost of ownership (TCO). 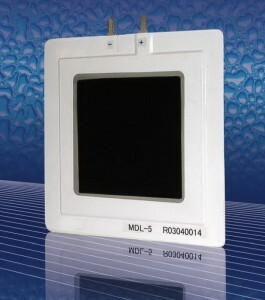 The manufacturer recommends mounting the dehumidifier over a cut-out at the mid-point of the enclosure’s vertical side panel. This is because moist air is less dense than dry air. Basic installation information is given in the accessory and installation page. See the product user guides in the documentation section for more information. Using Rosahl membranes to dehumidify an enclosure or cabinet is a simple process and starts with selection of the module type. The main requirement is knowing the ambient and target humidity, enclosure size and sealing. Suitable power supplies are also available.